Siqnal is designed to be an efficient project management system, where the right tool is essential to be able to get an overview of material and manpower resource usage at any given time during a project. 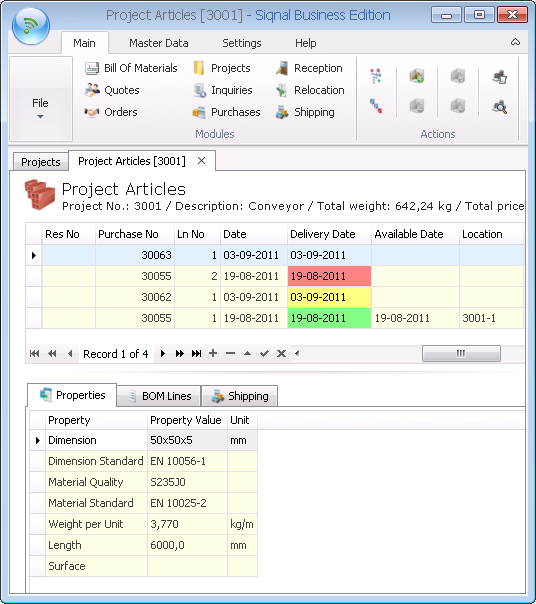 The Project BOM Management module in Siqnal is a good example of such a tool. The Project BOM Management part of Siqnal efficiently handles Bills of Materials that are assigned to the project and presents a perfect overview at all times during the project. Step 1: Select articles in Siqnal in the Project BOMs module. Select articles or BOMs by checking the checkmark at the Selected column. Multi selection can be done by checking a BOM (Assembly), which will automatically select all sub-items. 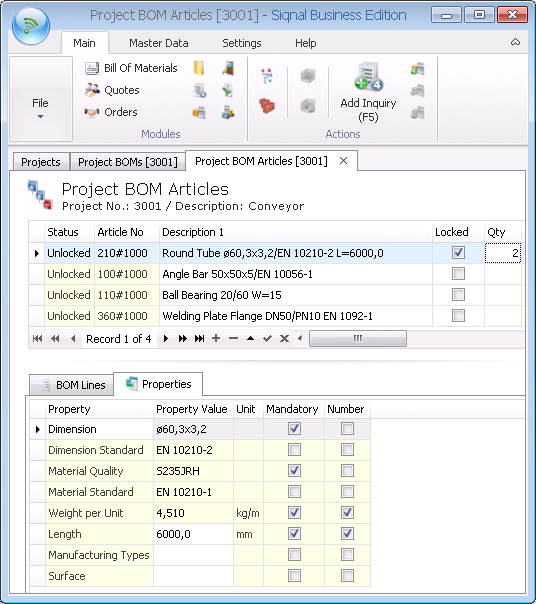 When new checkmarks are set and saved, data are transferred to the Project BOM Articles module. Project BOM Management: Select articles. Step 2: Purchase articles and/or make stock reservations through the Siqnal Project BOM Articles module. Articles transferred from the Project BOMs module are now shown on the BOM Lines tab in the Project BOM Articles module and the sum of all lines is shown at the bottom, including the correct consumption unit. At the top window, all article lines are shown that are to be used for purchases and reservations. When the locked column is checked, the number of articles to handle must be filled into the Qty field along with the correct properties in the properties tab. Once lines are locked, they can no longer be edited in the Project BOMs module and they are now ready to be purchased or reserved. Either the wizard Add Purchase or Merge Stock must be used to add a purchase or reserve articles from stock. From here on the column Status shows the progress of the purchase or reservation. Project BOM Management: Lock and fill in qty and properties. Step 3: Articles are monitored for correct quantity and delivery dates in the Project Articles module. Grid color = Article are not received and delivery date is later then today. Project BOM Management: Overview of all project articles.